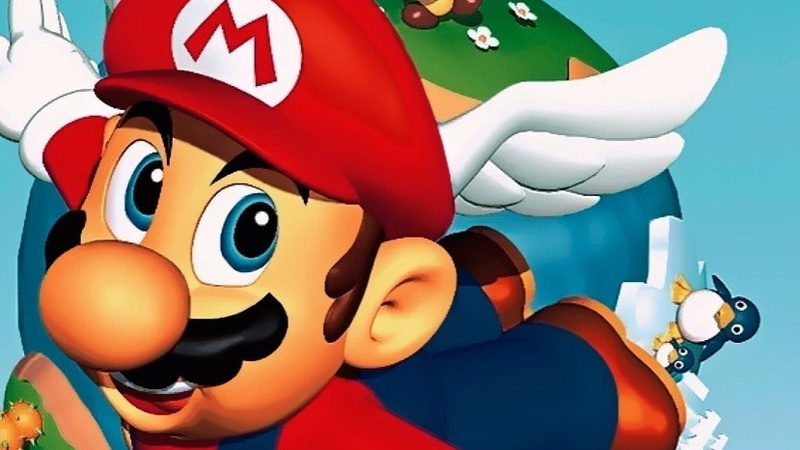 Super-early footage of Super Mario 64 and Super Mario RPG: Legend of the Seven Stars has resurfaced on the internet. The clips uploaded by the YouTube channel kukun kun, originally come from a '90s Japanese video game show hosted by Famitsu and are now being shared around by The Cutting Room Floor Discord channel and Nintendo subreddit. Around the six-minute mark of the first video, you can see an earlier version of Cool Cool Mountain from Super Mario 64. The portrait for this build is a generic snow-covered hill, instead of the usual snowman illustration featured in the final version of the game. Placeholder voices for Mario are present as well. If you keep watching, you'll see a much younger-looking Shigeru Miyamoto and beta footage of Mario Kart 64, which has already been well documented. The Super Mario RPG footage four-minutes in reveals Croco the crocodile bandit was originally green rather than purple. You can also see how the palace in Nimbus Land wasn't as overgrown and Yo'ster Island didn't have a race course around it yet. Do you like seeing early footage of iconic Nintendo games? Does this bring back any memories of the N64 generation? Tell us down in the comments. Come ooon, Nintendo! Give us Super Mario 64 HD! I never got to play when I was young, so it would be a blast to play it on the Switch. I love cut/altered content secrets and analyzing them. Great find! Cool stuff! I'll have to properly watch the videos later. I'd love a port of the DS version of Mario 64 with proper joystick controls. I like that version for the different playable characters. That was one of my few disappointments with Odyssey - you only play as Mario. I mean yeah, there's like 42 thousand customs or something but they are all still Mario and play the same. @MattFox damn a Mario 64 remake in HD would be sweet! Super Mario 64 HD remastered and a bundle Super Mario Galaxy 1 & 2 HD !! Wow, Miyamoto looks so young! The game doesn't look much different but it's still interesting to see nonetheless. I'd love a remake of Mario 64. I'm one of the few people that LOVED Mario 64 DS. I personally think the d-pad was an issue at all (I played through DS version multiple times and even 100%'d it). But a fully HD version of the game with a bit more additional content would be amazing, especially after so many years. Regardless, it's nice to see beta this beta footage! @wiggleronacid Never underestimate the effects of 22 years of aging. Although, given how long and hard Miyamoto has been working, -and he was a smoker and a gambler, he's aged pretty well. Sure, he's not been down a coal mine, but I don't think I could put the hours he puts in without mortally injuring myself. I'll like to see a Super Mario 64 HD Definitive Edition with even more stages and areas than the DS remake which wasn't bad, but didn't have that colorful look of the original Mario 64. With how big was the impact of this game, I wouldn't be surprised if they give us something in either 2021, where this game becomes (Edit) 25 years old or in 2026 (Edit) (30 years). @MattFox Well we have Super Mario Odyssey which surpasses SM64 in every possible way. Isn’t that cat guy one of the Mystery Mushroom costumes in Mario Maker? He looks familiar. I remember playing Super Mario 64 prelaunch at Toys R Us and it blew my mind. Those were exciting times. I want that white N64 jacket !!!!! The only mario RPG game I've completed so far is Dream Team Bros... But fron the looks of the preview I certainly need to go back to the original. Is all of that in the game? @nkarafo How could anyone possibly downvote this? This would be a dream. I want that white N64 jacket. I remember there was one screenshot in the Super Mario 64 manual that used the beta icons for the stars/lives/coins. Confused the heck out of me as a kid. I love the look on the player's face when he first started running around at the beginning of Mario 64...IN THREE DEE! I honestly remember that feeling. What a time to be alive. No game can be talked about without the port begging. Wow! It's always interesting seeing this sort of thing. I hope someone could get beta cartridges of Super Mario 64 so everyone could try them out. I still remember the first time I played Mario 64. It blew my mind away. The Beta stuff is always interesting before the final product arrives. @wiggleronacid Honestly he still looks pretty young...in fact he doesn't look all that different, which is astounding. There's something in the water in Kyoto that I'm pretty sure is a fountain of youth. Sure he's aged, that was a long time ago....but he's aged a lot less than mortals do in the same time period. It's amazing how little he looks different! Always cool to see how our favorite games looked during their development phase. I loved Super Mario 64 as a child and though it shows some signs of aging, I still love it today! @Jayofmaya it’s cut content. The game is amazing though, it’s my favorite Mario RPG. @TheFongz I came to say the same thing, the look of excitement made me smile real big. I like that they changed Croco's color; that makes him more unique IMO. Makes me want to play Mario64 again. Has some amazing music tracks in it. Not sure why Nintendo see's no value in bringing these games to the Switch. Many like Mario64 I'd buy over and over. I for one really enjoyed looking at all the 90's tech, dress, and design in the videos. Interesting time capsules for sure. What's the RPG in the first vid at the 20:42 mark?! Cool, I didn't know there was Super Mario SameGame on the SNES. @ShadJV Thanks for the info. I'll pick it up, on my wii u later! @Jayofmaya hope you enjoy it, it’s easily in my top 5 favorite games! @MattFox I never got to play when I was young, so it would be a blast to play it on the Switch. You can play it right now on the N64, the Wii, Wii U and DS (3DS if you prefer). No need to wait any longer. Always cool to see how these games looked pre-release. Zelda 64's beta can be equally fascinating to check out. ...Mallow is wearing actual pants!! His equipment makes more sense now! @MattFox I went from the SNES to the N64 but that doesn't mean I didn't get a Playstation years later. I thought most people did this rather than wait decades for a game to come to console that they happen to have. @Crono1973 Go talk to someone who cares about your opinion.